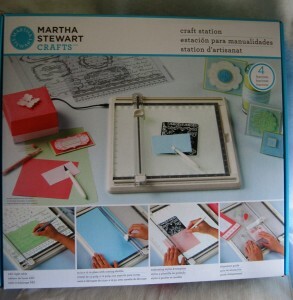 Here’s another new, wondrous addition to the Martha Stewart Crafts line by EK Success– the “Craft Station.” It’s a multi-use light box/cutting surface/stamping positioner that is full of whistles, bells, and potential. And lucky me, I get to be among the first to review it! Let’s dig in…. Our Craft Station offers endless possibilities for creativity. This all-in-one system makes hundreds of projects a breeze. 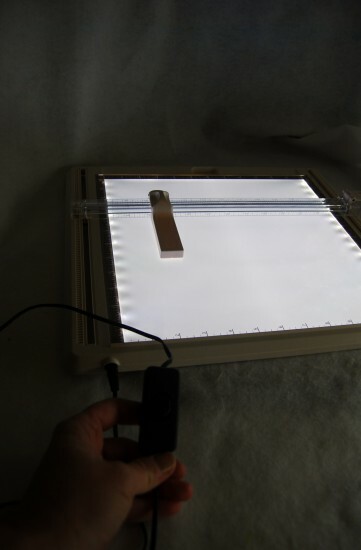 LED light illuminates your projects making it easy to trace designs and align stamps for accurate impressions. Moveable ruler arm with blade offers smooth fluid movement making paper cutting neat and accurate. Plus, blade replacement is hands-free, quick and easy. With so many uses and functions, our Craft Station will be the showcase of your craft space. â€¢ Blade replacement cartridge with 2 blades. Box Measures 16.75in x 15.25in. Wow. That’s LOT of information…. but can I actually figure out how to use it?? Let’s start with what I saw when I opened the box & got it set up. Included tools: cutting shuttle, blade changer, stylus, craft blade. It comes with the stamp positioner installed on the moveable arm. The on/off switch is on the cord. "Let there be LIGHT"- and lots of it! 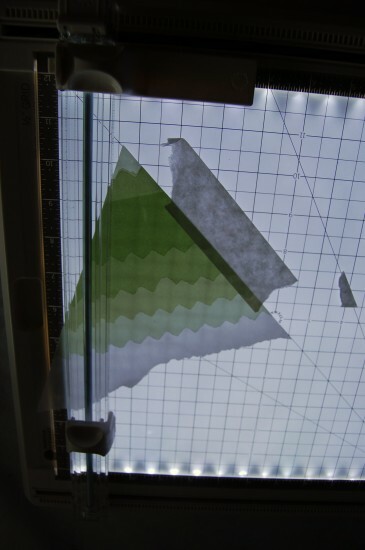 Sliding the gridded plastic template in behind the glass plate. To use the cutting shuttle, just slide it onto the track in the arm. Now you can use the Craft Station just like your regular paper trimmer! I used the diagonal grids to measure and cut some vellum for a Christmas Tree card. I liked the smooth glide of the cutting shuttle on the glass. OR you can use the included Craft Blade, if you like. I LOVE that they included both. Next, I tried some dry embossing. If you’ve ever tried embossing on a regular table top- or (eek) pressed up against a window- you know that this is super-handy. 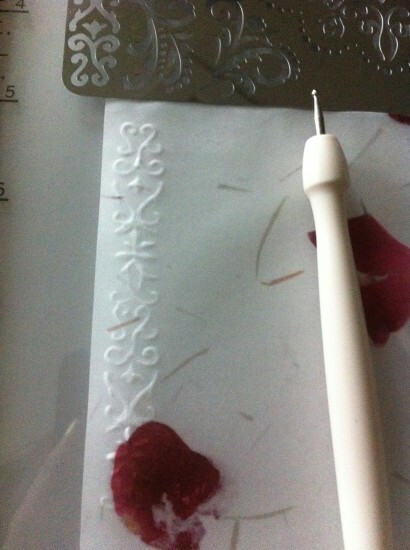 The Craft Station from Martha Stewart Crafts may just be the tool that re-awakens my desire to dry-emboss EVERYTHING. It really makes it super-easy to get great results! 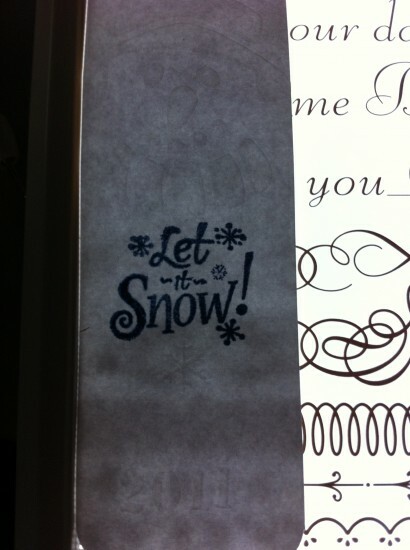 Note: Keep some painter’s tape handy so that you can tape your stencil and paper securely down while dry-embossing. It’ll keep everything from shifting about. Then I used the “arm” to use as a stamp positioner. But….here’s the deal: only one side of the cutting surface as a raised lip to brace your project against. I like to nestle my stamping projects into a corner, so they won’t shift while I’m stamping- but the Craft Station is “missing” one on the bottom edge. I kept worrying about it shifting. Make sure you keep some painter’s tape handy for that, too. 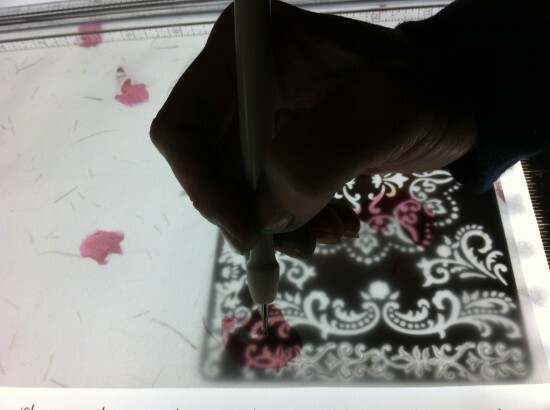 Lastly, I wanted to try some of those pretty, fancy designs on the acrylic sheets that you slide in under the mat. I positioned my bookmark on top…and couldn’t see the lines to trace. It was only text-weight paper, so this was a big disappointment. The plain lines are bold enough to see, but the fancy/filigree/calligraphy ones just don’t show through enough- the designs are too close and/or lacy. Simpler, plainer, (and frankly more practical) designs should have been included instead. Great low-profile made it easy to work on. Can’t really see the designs on the acetate design sheets when trying to trace with anything other than vellum. Lights bothered my eyes after a while. 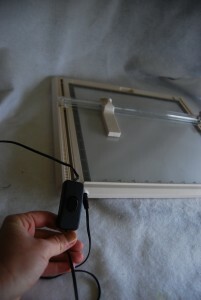 This tool comes with a substantial price tag- it’s $164.00 USD and will start shipping on 12/06/11. I would have a hard time buying this for myself….but that being said, if it appeared under my Christmas tree I wouldn’t return it. Thats not fair!I read my way down the page and really want one and then it hits me at the bottom ….the price! Don’t know where you got your info but my husband bought this for me at Michaels on black Friday. It was $99 and he used a 50% off coupon so you might want to check on that info. I got that from the website yesterday- it said it was available for pre-order only, $164.00 USD, and shipments were going out 12/6. After checking today, I see that the page is “moved” and there isn’t any info about pre-ordering at all. Wonder if the are re-evaluating the price point? I purchased it yesterday at Michaels(Reg.$99.99) with a 50% off coupon, so they are out there now. I was excited to get it, but I am kind of disappointed. I find the cutting feature to be very awkward as you have to line up the paper using a tiny line on the blade shuttle which is not marked…just a slight indent. 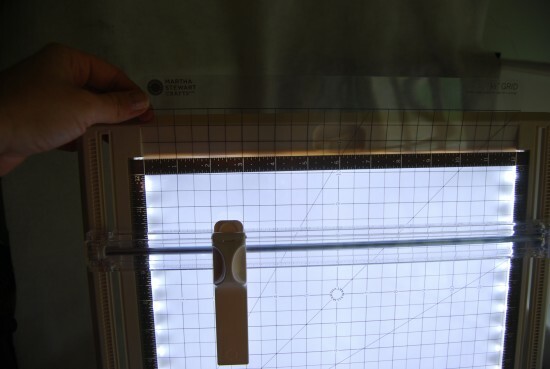 You are supposed to be able to slip some of the acetate tracing sheets into the light box but it is impossible to get them in on mine. It just seems like there are a lot of “bugs” in this new product…maybe rushing to get it to market for the holidays. You can get at A. C. Moore for $99.00 until end of February. There is a slot for you to slide the grids and templates into. Look carefully- it’s there! I just received mine in the mail. I love the idea and all features are fabulous with the exception of the paper trimmer. Difficult to see for accurate measurements and the blade does not cut paper well. it tears 80# paper and doesn’t cut through 120# paper. 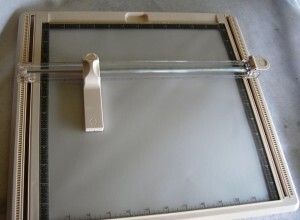 Too bad that the paper trimmer is the feature I will use 90% of the time! You are only supposed to put the sheets under the glass if you’ll be cutting with them. 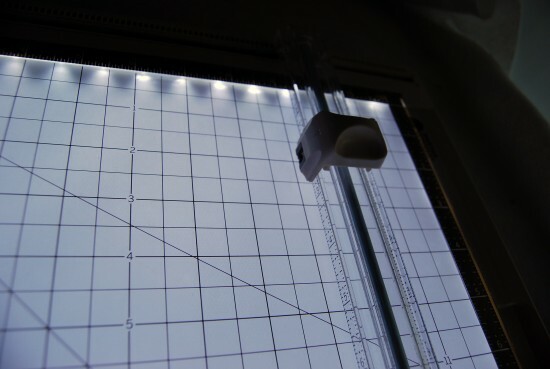 For the sheets that are meant to be traced, there’s no problem seeing them through most cardstock as long as you put them on top of the glass (not under it). I have many non-white, non-pastel colors of cardstock and there were only a few very dark/dense colors I couldn’t see the designs through. I tried putting the designs under the glass too and was so disappointed when I couldn’t even see them through yellow cardstock. 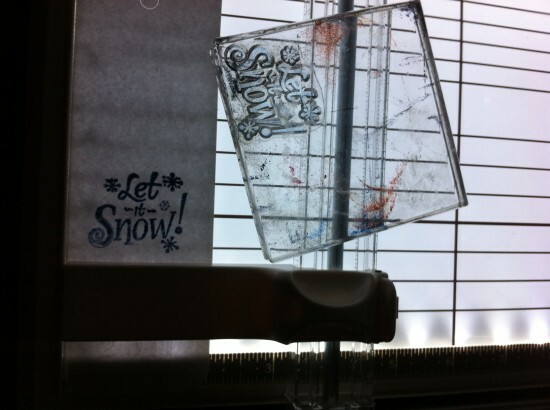 But put the designs to be traced on top of the glass and voila! Good tip! I’ll give it a try- thanks Crafty! 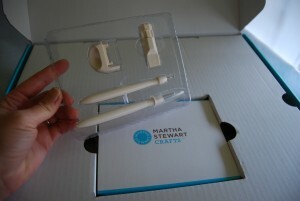 I just bought this martha Stewart Crafts station and was so happy to use it, not now. I only played with this for 45 minutes that’s all the time it took to fall apart. The first problem was the back plate where the cord plugged in poped off. Second problem was plastic sheet didn’t really didn’t want to go in. The third problem was I couldn’ t see anything AT ALL!! So I put the plastic sheet under my paperon top of the glass. The forth problem was when I pulled a sheet out from under the glass it pulled out a piece paper that makes the glass look frosted. So I thought it was packaging and pulled it the rest of the way out. Then the fifth thing to happen was there were tiny metal bb’s that came out from under the alignment guide. I don’t like that there is only one lip. Love the extras but wish there was something to put everything in or some were to sit stuff. I am so so disappointed and am taking back first thing in the morning . I don’t think I will buy another Martha Stewart product ever again. I all so for got that the cutting blade has to aeros or lines to see where to cut and the light starts to hurt your eyes I would not even give it 1 star.